Transformers: War for Cybertron was delisted on Steam on December 21st, 2017. The game was on sale on Xbox 360 and remained available digitally through December 31st. 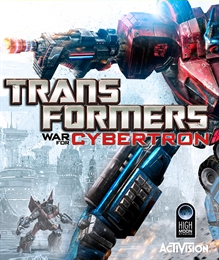 Like many previous licensed Activision franchises Transformers: War for Cybertron was delisted at the end of the year in which the license expired alongside several other titles in the Transformers series. See the linked pages to the right for more. Transformers: War for Cybertron remains available on physical media for all platforms it was released on except for Steam. “Transformers: War for Cybertron features two distinct storylines: the AUTOBOT campaign tells a story of heroism to save their home planet against overwhelming odds, and the DECEPTICON campaign tells a story of an unquenchable thirst for power to control the universe. For the first time in a TRANSFORMERS title, fans will be able to play the game with their friends through team-based online co-op, or go head to head in a variety of intense, online multiplayer game modes. The game features a sci-fi art style that introduces fans to the entire living, metallic world of CYBERTRON, as well as all-new visualisations of the iconic TRANSFORMERS characters in their original Cybertronian forms.